Warm up before a sprint to avoid serious injury. Professional athletes know that a proper warm-up is essential to success. Warming up before sprinting is especially important to prevent injuries such as strains to your muscles and ligaments. Because sprinting requires your muscles to respond quickly, they need to be warmed up sufficiently before any competition or training routine through a series of warm-up drills and stretches. 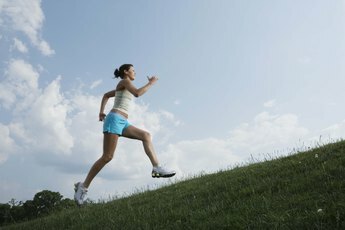 Begin your warm-up with a light form of cardio, such as a brisk walk or a jog around the track. Your initial warm-up should last about 20 minutes, and you may be sweating slightly by the end. The goal of this brief cardio exercise is to raise your body's temperature and heart rate slightly before your race. Stretching is an important step to your warm-up in order to loosen the muscle groups you will need to use in the sprint. 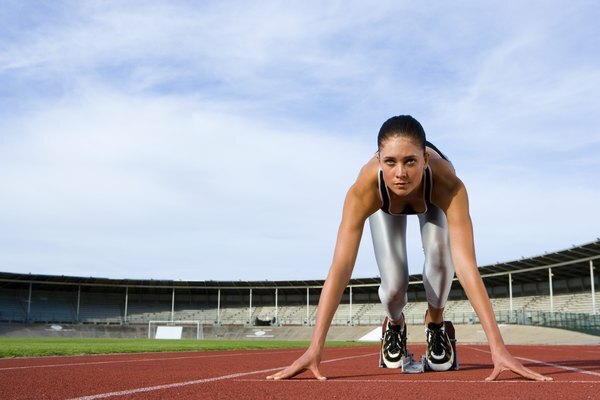 Focus on your leg muscles, such as your hamstrings and calves, through stretches such as the hurdler's stretch. Sit on the ground with one leg extended and the other bent, with the flat of your foot against the thigh of your extended leg. Bend at your waist and reach for your toes, holding the position for about 30 seconds. Alternate legs. To stretch your quads, balance on one leg, and fold the other behind you, grasping your ankle with your hand behind your back. Hold for 30 seconds and alternate legs. Increase your range of motion and flexibility through warm-up drills such as high knees and lunges. Take a step with one leg, bending at both knees but keeping the back knee off the ground, balance for a moment, then switch legs. The lunge can also be performed laterally to improve your balance for the curves of the track during a competition. Finish off your warm-up with short sprints, increasing your pace and intensity at intervals. For example, sprint as fast as you can for 10 meters. Then increase that distance to 20 meters, then 30, then 40. When you have finished your accelerations you are ready to run.